CMCA facilities are located on four separate sites including the third floor of the Indian Ocean Marine Research Centre (IOMRC) building on the Crawley campus. Access to these facilities is by UWA campus card. The FACSCalibur analyses cells or particles at a rate of up to 2000 events per second, a high throughput sampler (HTS) allows for automated sampling from 96 or 384 well plates. Analyses include immunophenotyping, viability, DNA content, cell cycle, plant ploidy, DNA/RNA ratios, apoptosis measurements, cytokine expression, intracellular calcium, oxidative burst, intracellular pH, phagocytic activity, mitochondrial membrane potential and bead array assays. Flow cytometry analysis generates bivariate dot-plots and histograms which can be used to calculate population statistics and changes in mean-fluorescence intensity within the sample. The Leica is an inverted microscope with eight laser and multi-photon excitations. The system is capable of simultaneous image collection, quantitative confocal image analysis, 3D reconstruction and most multiphoton microscopy techniques. A separate Becker & Hickle Fluorescence Loss Imaging Microscopy (FLIM) analysis system is also attached. 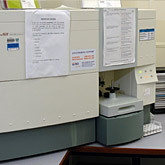 Software includes 3D reconstruction with rendering, multi-colour analysis, fluorescence recovery after photobleaching (FRAP) analysis, fluorescence resonance energy transfer (FRET) analysis, animation, stereo imaging, single layer projection and quantitative analysis, time-lapse collection, ratio quantification and co-localisation analysis of two or three probes. 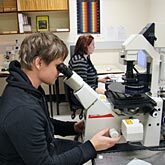 The Leica MP Confocal microscope and the BD Calibur Cytometer are located on the third floor inside AIMS. Users must be registered with CMCA and have a current subscription. Please complete both modules and send your certificate to Admin at CMCA (admin-cmca@uwa.edu.au). Swipe card access will then be arranged. Please contact the TGL responsible for the instruments for a walk-around inside IOMRC. Please complete both modules and send your certificate to Admin at CMCA (admin-cmca@uwa.edu.au). Swipe card access will then be activated. All instruments will need to be booked on ACLS prior to use.